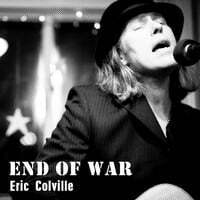 Every now and then someone comes along that turns heads in a matter of minutes and Eric Colville is the latest. Eric's thoughtful, clever lyrics and unpredictable rhymes are signs of a real rock and roll poet in the making. Absolutely, compulsively listenable. A+. Eric Colville Band’s X-Ray Glasses goes far beyond going through the motions; it goes through the ranges and delivers. and Lynn Novick, which was quite moving and underscored - at least for me - the senselessness of so many lost lives, especially when each soldier's personal story was told. I also imagined how wonderful it would be to be able to explain war in the past tense to my young son. With these things fresh in my consciousness I somehow arrived at the three opening chords which sounded so hopeful and uplifting and started singing "the end of war" along with it. As I wrote the song, I couldn't help but think of John Lennon's song Imagine, and I pay tribute to him in the second verse but also about the "war on terror" which I allude to in the 3rd verse. I feel the song definitely has that 1960's folk/anthem-like quality and I embraced it with the acoustic guitar and Beatle-esque a la George Martin orchestration.